Fill bell pepper half with hummus. Set on a plate. Add pretzel sticks and tomato halves for the tentacles. Slice 2 coin shapes from the cucumber and place on the hummus for eyes. Slice the remaining cucumber in half lengthwise and then slice into half-moons. Carve the flesh from one of the half-moons to create a smiling mouth. 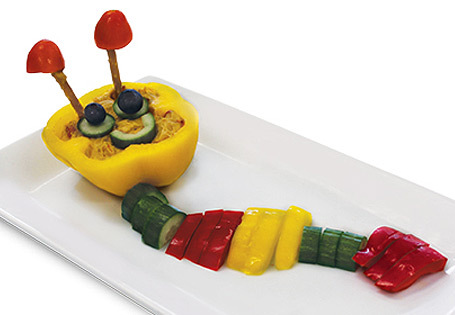 Arrange remaining diced vegetables into a curving caterpillar body.